On Friday morning, Chris Riekena left his eldest son at the bus stop and headed to drop his 7-year-old at school. He’d just turned off Minnesota Drive, up a curved ramp toward International Airport Road, when his Hyundai Sonata jerked sideways. “It felt like it was lurching side to side, like my suspension had gone awry,” he said. He pulled over to the side of the ramp. He saw streetlight posts sway. An earthquake. A transformer exploded, flashing light. His son, strapped in a booster in the back, hollered. He saw the taillights of another car just ahead. Then something strange happened. “Part of the road in between us had started to sink,” he said. The ramp was crumbling. 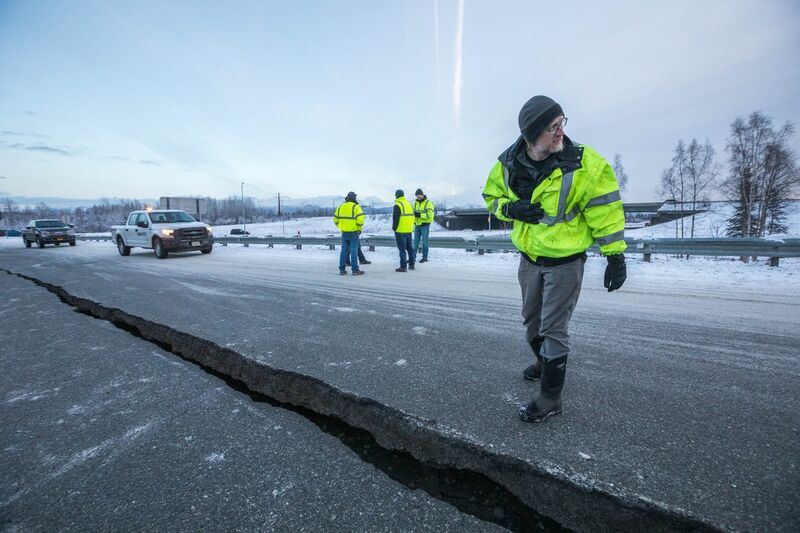 The first jolt of a 7.0 magnitude earthquake, the most significant to strike the region since 1964, rumbled through Southcentral at 8:29 a.m. Alaskans cowered under desks, ran down stairwells, pulled cars off the road and huddled with co-workers in parking lots. When the shaking stopped, dusty, shaken people stumbled out of wrecked offices and picked their way through kitchens strewn with broken dishes. Everyone had a story to tell. On the ramp where Riekena stood, the shaking subsided. He kept his eyes on the car ahead. "Somehow, amazingly enough, the road was destroyed all around the car, but it was like on an island of asphalt, " he said. "It was slow enough that it took a moment to realize what was happening, and what had happened. " Raymie Redington, son of Iditarod co-founder Joe Redington Sr., had just made a cup of coffee when the shaking began. His wife, Barbara, heard what sounded like a locomotive rumble from her bedroom. She stepped out to see shelves of collectibles — artifacts of a long Alaska life — exploded in shards. Except not really. A sugar bowl, given to her by a late relative at her wedding 36 years ago, sat broken. An ivory loon snapped. “The only thing left on the window sill was a bottle of dry flowers,” she said. At 8:29, in a condo off Potter Road, Daniel Reardon started his coffee maker. Then his floor began to pitch. He steadied his big-screen TV and and got hold of his German shepherd, Bella. The shaking intensified, then finally settled. He heard commotion outside. People from the business across the street came running and yelling. There was a fire in the condo across the way. Reardon knew the neighbors weren’t home, he said, but they have a dog. He grabbed his valuables and his dog and put both in the car, he said. Then he and the other men broke down the neighbor’s door. The dog wasn’t there. They ran through the condo, out the patio door. Smoke poured from around a utility room door. They dialed the fire department, but it was inundated with calls. “We opened the door and I grabbed the fire extinguishers,” he said. They fought the fire as best they could with a hose and extinguishers. When firefighters finally arrived, they found the fire was still burning in the roof, he said. “I was scared, to be honest with you,” Reardon said. He decided to spend Friday night elsewhere, even though his condo was undamaged. At the Nail Time & Spa on the Old Glenn Highway, owner Kim Nguyen was thankful her business only suffered a broken window and damage to one nail station. Her prized chandeliers, Nguyen said, were undamaged. “Isn’t that something?” Nguyen asked as she swept up debris from a broken window. Nguyen credited a ceramic Buddha statue near the entrance for protecting her shop. “I think the Buddha held everything up,” she said. In a science classroom at Wasilla Middle School at 8:29, teacher Sarah Coulson began a lecture on earthquakes, projecting a slide about magma and convection currents. Then came a rumble. Was it rowdy students in the classroom upstairs? The floor lurched. “My next thought was, I have to keep my kids safe,” she said. The tall desks hopped across the floor, she said, but the kids knew what to do. They dove beneath them and held them in place. Beakers smashed, blanketing the floor with glass, but no one was injured. Alaska Gov. Bill Walker had just left his office on the 17th floor of the Atwood Building at 8:29 and was at about the 16th floor when the shaking began, he said. Elevators in the building are notoriously noisy, and at first he thought the quake was cables slapping together in the elevator shaft. He looked at his security detail and rolled his eyes, he said. The rattling continued. Debris fell from the ceiling and a message of some kind flashed on a monitor. He kept expecting the elevator to stop, but it didn’t. He’d lived through the 1964 Good Friday earthquake in Valdez. “This could be the big one,” he thought. When the elevator finally reached the ground floor, the door opened only 8 inches, he said. A security guard had to pry it open. Janet Younger, a CPA who works from home in Eagle River, was walking on the treadmill in her garage, watching the “Today" show at 8:29. She heard the quake first. When the shaking stopped, she picked her way across the garage floor by the light of her Fitbit, calling her dogs. She had to move debris to make it upstairs to her kitchen. 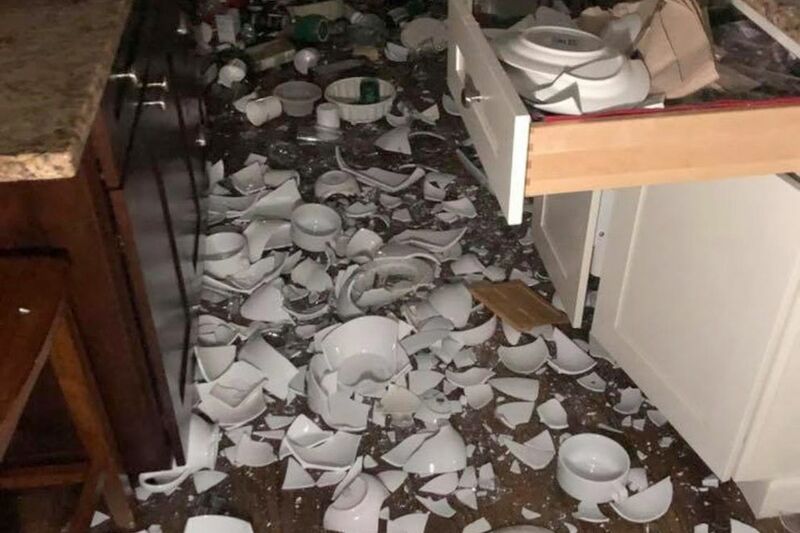 The kitchen floor was a sea of broken dishes. Some hit so hard, they gouged the hardwood. “Twenty bowls, gone, 100 glasses, gone. Half my white dish population, gone,” she said. Most remarkable: Her heavy kitchen island, topped with granite, moved 3 inches, grinding dishes beneath it, she said. She spent Friday cleaning up without power. Generators ran two small heaters. By the end of the day, she guessed she still had two days to go. At 8:29, Michelle Weston, Girdwood Fire and Rescue fire chief, sat on her bed, getting ready for work. Her log cabin rocked hard. The closets ejected their contents and frightened dogs leaped onto her bed. When the shaking stopped, she headed to the station, where she found glycol oozing from the heating system. “It’s a yellow nasty substance … that basically exploded and leaked all over so that’s how we lost our heat,” she said. 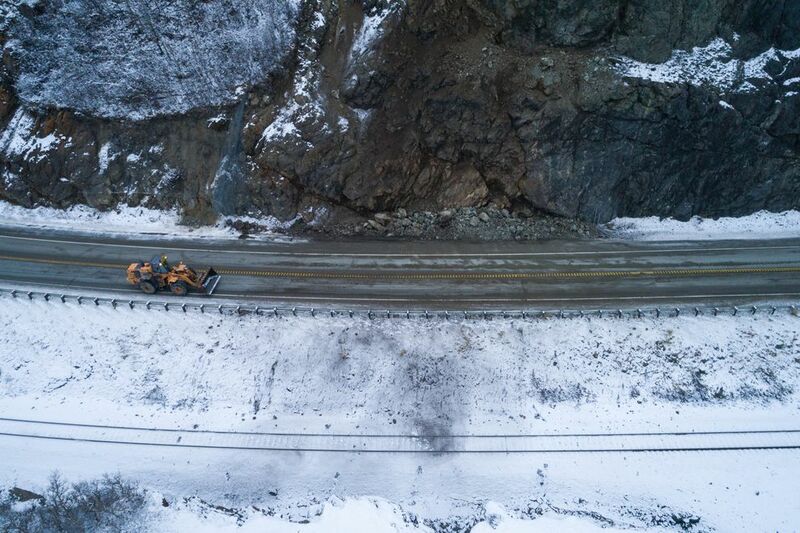 They soon got word a rockslide had closed the Seward Highway. And the local 911 system was down. They tried communicating with Anchorage by radio. Nothing. Girdwood was on its own. They called the local radio station, KEUL, where station manager Lewis Leonard, ankle-deep in thousands of downed CDs, plugged everything back in and broadcast the station’s phone number as an alternative to 911. Then came a serious emergency call: chest pain. They rushed to the patient. 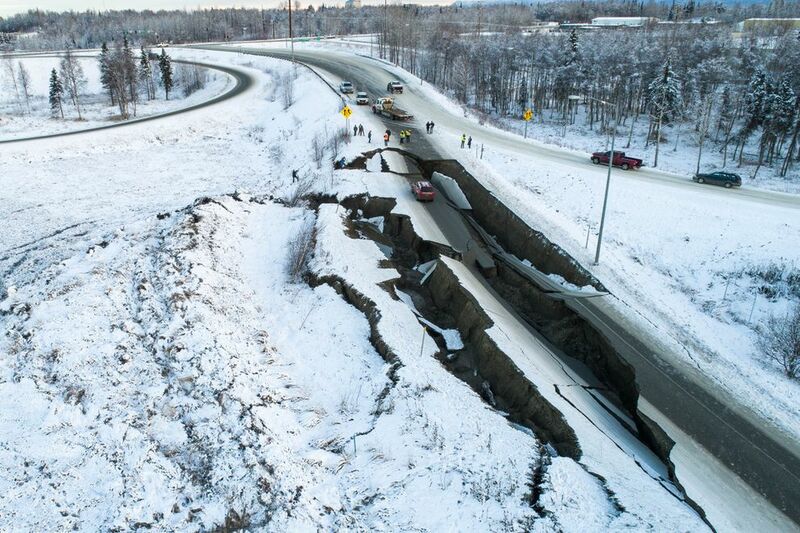 If that person needed a transport to Anchorage, it was going to be complicated. Luckily, the person declined a transport. Sometime after that, Weston returned to her house to find an aftershock had separated her water heater from the wall, flooding her garage. The highway re-opened. “That took down the stress level a huge amount,” she said. Between firefighters and volunteers, they traveled every street, checking to make sure everyone was OK. And they set up a shelter, just in case. ADN reporters Michelle Theriault Boots, Kyle Hopkins and Matt Tunseth contributed to this story.